My 2030 Prediction – Tesla will be valued at $1 Trillion and will be valued for 2 key technologies that will have a significant barrier relative to others. Chemistry and Intelligence (Machine Learning). While Tesla has motors in its logo today and will continue to build motors and cars and other automotive and transportation (electric) vehicles, I see its future has less to do with electric motors or even solar as the key driver of the company core value/IP and thus its business proposition. At the core of what Elon is building and ‘hard to do’ is battery chemistry and more interestingly is machine learning or intelligence. Let me start with the simpler one first and the more obvious one – Chemistry. It’s well known Tesla’s $5B factory in Nevada will be the driver of electric vehicles as we know and Elon as well as Tesla will continue to master the battery chemistry at scale for cars, trucks, home and anything anywhere that needs storage. 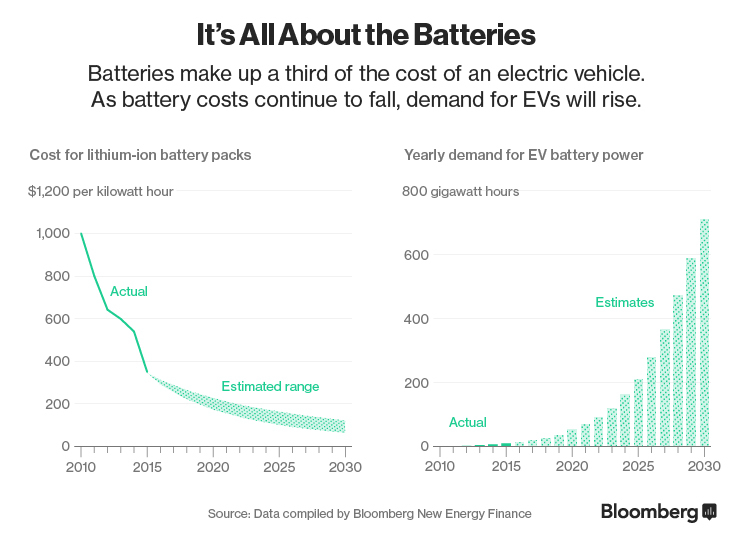 While there are more efficient forms of energy storage, and the issue of supply of Lithium, cost of battery and efficiency growth of 5-7%/year are issues, the sheer momentum and size of market with cars and trucks will enable Tesla to have to engineer better batteries (i.e. chemistry) as it is at the core of value proposition of all electric vehicles. There are a couple of other side effects. First the oil glut will get worse and I expect it to start around 2018 and be in full swing by 2020. The big shift in the entire value chain of the internal combustion eco-system will start around the same time. We will need fewer gas stations. We will need fewer auto service shops. With Tesla model of Apple style sales going direct, it will have an impact of the overall employment workforce as well. The second more interesting one is intelligence or machine learning or AI as its called today. We are at the Cambrian explosion era for machine intelligence or machine learning. Clearly the autonomous car is the driver for it. What is unique about Elon’s and Tesla’s approach is that the car is the best vehicle to be on the exponential curve of this technology evolution. If you consider the parallels with biological evolution, survival required better audio and later visual perception. The advent of mobility ( one of the inflection points amongst many) of the biological organisms leading to rapid evolution of the visual cortex which holds highest percentage of the brain’s volumetric space. This evolutionary growth while driven by the need for survival was a big trial and error experiment over perhaps a few billion years and out of that sensory path all kinds of decision making processes were developed. So the assertion here is that Autonomous car is going to drive machine and deep learning tools and techniques more so than any other platform. That will include chips, platform (HW), platform (SW) and more importantly algorithms and decision processes need to meet and perhaps exceed Level 5 standards or approach a human and perhaps exceed. Tesla has a lead on this over others including Google as they have now >100K vehicles on the road. Iterating on this and soon by 2018 going upto 500K and soon after 1M. That will be a key inflection point – analogous to the million eyeballs or developers being key for a platform success in the 1980s or 1990s (windows , mac and solaris were #1, #2 and #3 and all others dropped off), 100M for the web/social era, the same will hold for autonomous car driving the platform capability for ML/DL. Now lets contrast Tesla’s approach to Google. Tesla is taking an iterative, real world approach. Waymo i.e. Google is trying to build the best autonomous system first. We know the latter is harder and likelihood of market success is linked to multiple factors over time (except for Steve Jobs who knows how to build the perfect platform before he releases one). So the Tesla approach is solving the hard ML/DL problems using the car as the ‘driver’, while the google approach is taking a platform (ofcourse solving Google’s other applications) approach. What’s interesting is ‘intelligence’ exploded in the biological evolution with mobility linked to survival and thus mobility became a critical ‘driver’. There are many other drivers of ‘intelligence’ but for the near term – this is a key ‘killer’ use case to drive platform evolution with significant business value. So if we take the evolution of battery chemistry of the next 14 years and the evolution of autonomous system including the level 5 decision making system which is mobile and making real time decisions at speed and criticality of the ‘goods’ it carries, I have to posit that the core value of Tesla in 2030 will the chemistry knowledge of the battery and the ML/DL platform that it will build. Behind the ML/DL platform will be silicon for processing in the car, the data (and energy) storage, the intelligence at the car level, the big data hub or data center that each car will provide and on and on and on…The Android vs iOS analogy applies. One took a platform approach to go to market and the other took a vertical integration approach. So, while Google will drive the developer adoption of ML/DL, quietly but surely Mr Musk (and thus Tesla) could well emerge as the leader and in delivering the industry leading ML/DL platform. It won’t be restricted to just automobiles or transportation. Like biological evolution, its a winner takes all game. Homosapiens killed all other forms. Expect Tesla to drive this platform and that might well be its monetization model. I thus speculate, It will be in the battery chemistry and the platform intelligence that will be at the core value of Tesla’s drive to a $1 Trillion in valuation by 2030. Matias Bjorling in the paper he co-wrote in 2012 calls for the necessary death of the block device interface in the linux kernel as we know it. Flash was just emerging as a storage tier in enteprise and infrastructure IO stack back then. Going back to the era of the creation of block device abstration in Unix (late 1970s – early 1980s), POSIX (IEEE standardization efforts) also published file and directory access APIs that are OS independent. Around the same time 3.5″ HDD (Circa 1983) came into existence that enabled both the PC and the workstation form factors. The operating system level abstraction and the IEEE standardization process enabled storage to be segregated as a set of well defined APIs resulting in storage as an industry – which over the past 30 years is more than $50B in size. 30 years later, the flash entered the enterprise or infrastructure segment. Around the same time a number of KV stores have emerged that have tried to map application use cases (NoSQL, databases, messaging to name a few) to flash and used variety of KV abstraction APIs to enhance the integration of Flash in the platform. Around the same period, we have also seen object stores emerge and the cloud and S3 has emerged to be a default standard effectively as an object store, specifically to users of AWS. Emergence of S3 as a dominant API for application programmers to leverage cloud based storage and in general S3 as a dominant API for today’s programmer. Its obvious that the new storage API will be some variant of a KV store. Its obvious that the new storage will be ‘memory centric’ in the sense that it has to comprehend the SCM and Flash Tier as the primary storage tiers and thus adhere to latency and throughput as well as failure mode requirements. If the new interface is necssarily KV like, why not make ‘S3 compatible’ interface for the emerging new persistence tier (SCM and Flash). Standardization is key and why not co-opt the ever popular S3 API? AWS has a unique opportunity to re-imagine the new memory stack (SCM, flash) and propose a ‘high performance’ S3 compatible API and offer it as the new ‘POSIX’ standard. —– Thinking Path ——- Blog at WordPress.com.